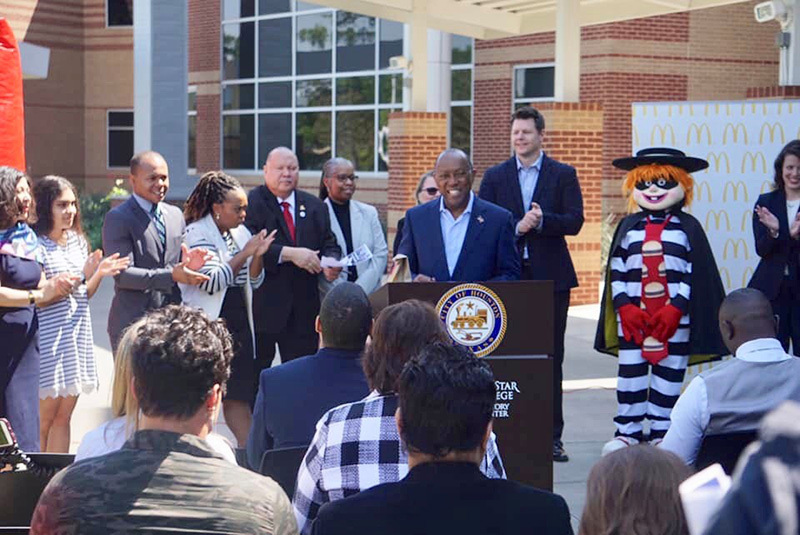 March 22, 2019 -- Mayor Sylvester Turner joined business and community leaders Friday to announce his signature Hire Houston Youth program will provide 10,000 summer job opportunities for young people ages 16 to 24. "Hire Houston Youth offers young people access to training and connections to local resources. It is designed to build their social capital and empower them to succeed in today's economy," Mayor Turner said. "I am asking the business community's help to spread the word, offer jobs and recruit young people into the program." The mayor was joined at the announcement by Dave Moss and the McDonald's owners and operators of Greater Houston, Dr. Stephen Head, Lonestar College Chancellor and Carolyn Watson, JP Morgan Chase, VP of Global Philanthropy. Other donors and partners attending included Aldine ISD, AT&T, BakerRipley, Burns BBQ, Chevron, Citgo, Comcast, Greater Houston Partnership, HGAC, Houston Airport System, Houston Food Bank, Houston Independent School District, Reliant, Student Conservation Association, Verizon, and Workforce Solutions and many others. JP Morgan Chase has generously donated $100,000 to Hire Houston Youth (HHY) to create the HHY Healthcare Scholars program. Healthcare is one of seven sectors critical to the Greater Houston region's economy, and while there is great student interest and demand for skilled healthcare workers, a disconnect remains between students, educational institutions, and employers. For more information - https://www.houstontx.gov/mayor/press/hire-houston-youth-applications-2019.html.